The County Council began the day Monday, May 14, sitting as the District Council to consider zoning matters. On Monday evening, the Council convened as the Committee of the Whole to hold a Zoning Rewrite work session on CB-13-2018, CB-14-2018, and CB-15-2018, the proposed Zoning Ordinance Rewrite legislative package transmitted to the Council by the Prince George’s County Planning Board for consideration. Monday’s work session, which featured public comment, was the first step in a robust legislative process to include multiple Committee of the Whole work sessions. Visit the Council’s Zoning Ordinance Rewrite Portal to learn more about the proposed bills, future worksessions, and how to submit public comments. The Council presented proclamations on Tuesday, May 15th, celebrating the Eleanor Roosevelt Girls “Lady Raiders” basketball team, the winner of the “4A State Championship.” A proclamation was also presented to NGEN, LLC, a local business recently named to the “2018 Tech Elite 250 List.” Capitan David Lorenzo received a Council proclamation for the Salvation Army, recognizing May 14-20, 2018 as “Salvation Army Week” in Prince George’s County. 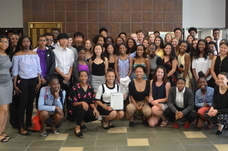 The Council also presented proclamations celebrating the Eleanor Roosevelt Girls “Lady Raiders” basketball team as the winners of the 4A State Championship; the Eleanor Roosevelt Girls Lacrosse team as the Prince George's County Girls Lacrosse Champions; and the Eleanor Roosevelt Boys Lacrosse Team as the Prince George's County Boys Lacrosse Champions. The Council was briefed on the 2018 Prince George’s County Charter Review Commission recommendations by The Honorable Camille A. Exum, chair, on Tuesday. Section 1106 of the County Charter provides that the County Council and County Executive appoint, by resolution, a Charter Review Commission to undertake a comprehensive study of the Charter and make appropriate recommendations to the County Council and County Executive, for proposed Charter changes. In July, the Council will transmit the approved Ballot Question Resolution, with a list of proposed changes to the Charter, to the Board of Elections. The Charter Amendment ballot questions will be certified by the County Attorney to the Board of Elections by the third Monday in August, after which the proposed Charter Amendments will appear on the 2018 General Election Ballot for voter consideration. The County Council, sitting as the Board of Health, on Tuesday, received a briefing by consultant Dr. Joseph L. Wright, MPH, who provided an overview of the Cardiac Surgery Program at University of Maryland Capital Region Health. The Board of Health also considered Certification of Need (CON) Support requests from the University of Maryland Capital Region Health, Encompass Health Corporation, and Adventist Hospital. The Council’s Planning, Zoning, and Economic Development Committee held its final Fiscal Year 2019 Budget work sessions on Wednesday, April 16, with a review of the proposed budgets for the Financial Services and Economic Development corporations. Adoption of the Fiscal Year 2019 Budget is scheduled for Thursday, May 24th. 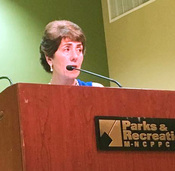 District 1 Council Member Mary A. Lehman welcomed residents to the District 1 Annual Town Hall Meeting, “Bringing Government to Our Community,” on Wednesday, May 16, 2018, at the Laurel-Beltsville Senior Center in Laurel. Residents received an informative update on the proposed FY 2019 Budget, had the opportunity to speak with various State and County agency representatives, and enjoyed refreshments. On Friday morning, May 18th, District 2 County Council Member Deni Taveras, in partnership with the Office of Central Services Supplier Development and Diversity Division, was the latest of her Council colleagues to serve as host for “County Connections – Making Intentional Connections,” in their respective districts. This is a business forum designed to highlight public and private procurement opportunities in Prince George’s County. The May 18th forum was held at the Rollingcrest Community Center in Hyattsville, featuring presentations on procurement opportunities available to Prince George’s County business owners. Representatives from the financial industry were among those on hand to discuss funding opportunities. "All County Council, District Council and associated data are intended to provide general information and are not to be used as a recognized reference or for official purposes.